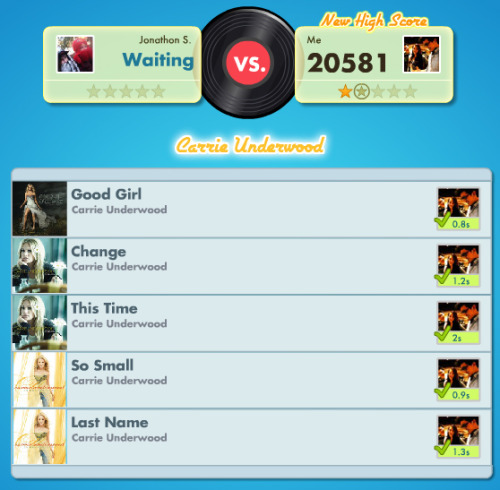 The game SongPop [you can play on Facebook, iPhone, iPad, iPod Touch] has a playlist just of Carrie! You'll have to look under 'Special Playlist' So far Carrie is the only single artist playlist the game has! liveasong, Ann055, teesharky and 3 others like this. Guys people are hating on Carrie on the SongPop Facebook page. Well not hating hating... hating they picked her as a playlist. We got to do something about it. And its not just her singles, its everything! What is a Song Pop Playlist? ^its a facebook game where you try to guess the song or artist as quick as possible..trying to beat your opponent. Its awesome. They have different categories like Modern Country, Classic Country, Rap, 80's rock, hairbands, alternative, tv shows you name it lol now Carrie Underwood! opry051008, teesharky and rainbow1 like this. Songpop is a game on iPhone and Facebook where you hear a sample of a song and you have to identify the song or artist as fast as you can. You play against your friends. Back in my heyday, I pummeled Jess, but she got good, and I got lazy. Anyway, you get to pick a genre per round, and there are five songs per round. If Carrie has her own playlist, that means all five of those songs will be Carrie songs. It's Name That Tune for the social media age! Wonder if Jukebox Carrie plays and if so I wonder if anyone has beat her. The problem I have with all these games is I don't have enough friends who play them to get any good. Words with Friends was the same way and I quit playing. opry051008, teesharky and Gator like this. I have a shot at beating her at metal. But if she beats me at that, all the more reason to love her. Oh how fun! I will download it on my iphone now! I love guessing song titlles and artists! Aww, this sounds like fun but I don't use any of those social media sites or istuff. Yes, I'm an ancient. And Carrie tweeted a fan about it. I can picture her playing it right now. You don't have an iPhone? I wanna play you! You'd probably beat me, though. I fail at top 40. It's laughable, honestly. No iPhone... I can already hear you snickering. Top 40 is easy, it's the same words over and over again. I could smoke you with Englebert Humperdick tunes. LOL! Daraebe, opry051008, Gator and 3 others like this. Top 40 is not easy. I don't think I've ever won, and I usually miss at least 3/5. They also have a love songs category and it's the easiest category ever. Besides Carrie. Now, I really wish I could play you, I love to win. That like was a slap. I'm beginning to enjoy those slaps. Is that bad?